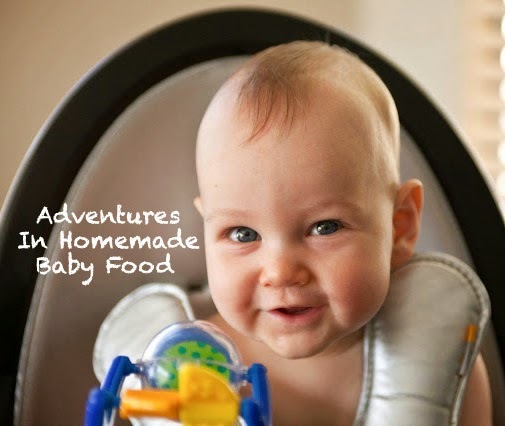 Adventures in Homemade Baby Food! 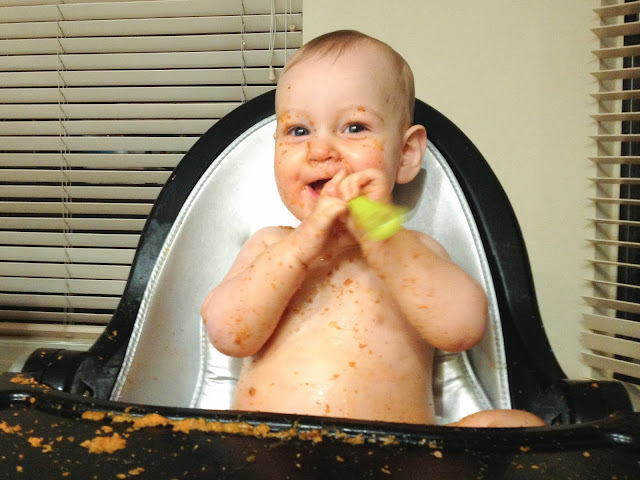 We are four months into solids and what an adventure it has been! 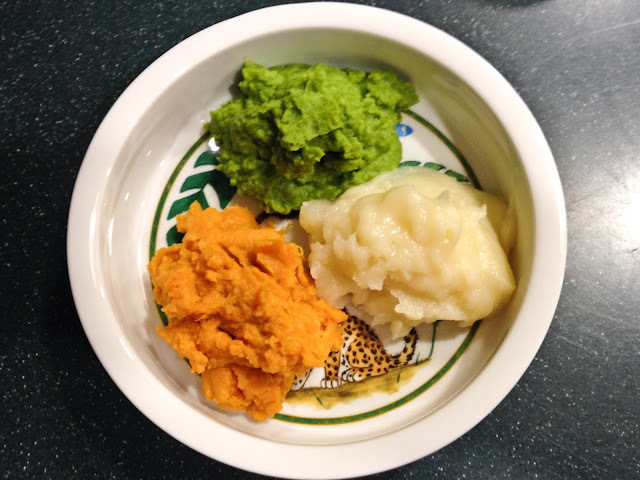 We began solids soon after Parker turned five months. Baby boy was ready and gobbled up anything I made him. 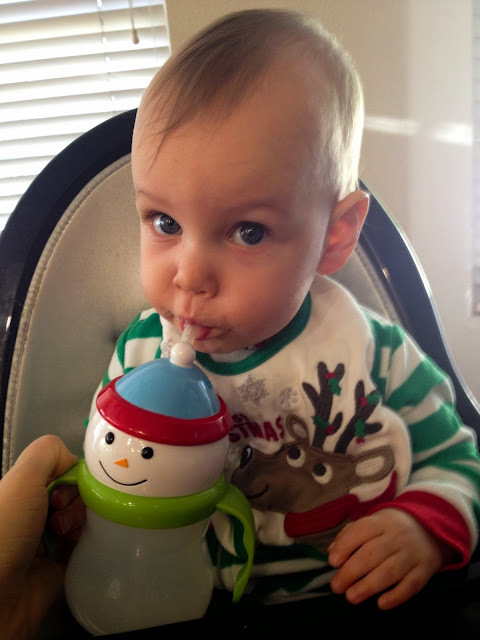 At first, I pureed and pureed and pureed the foods (and added water) until what he was getting was almost whipped air! 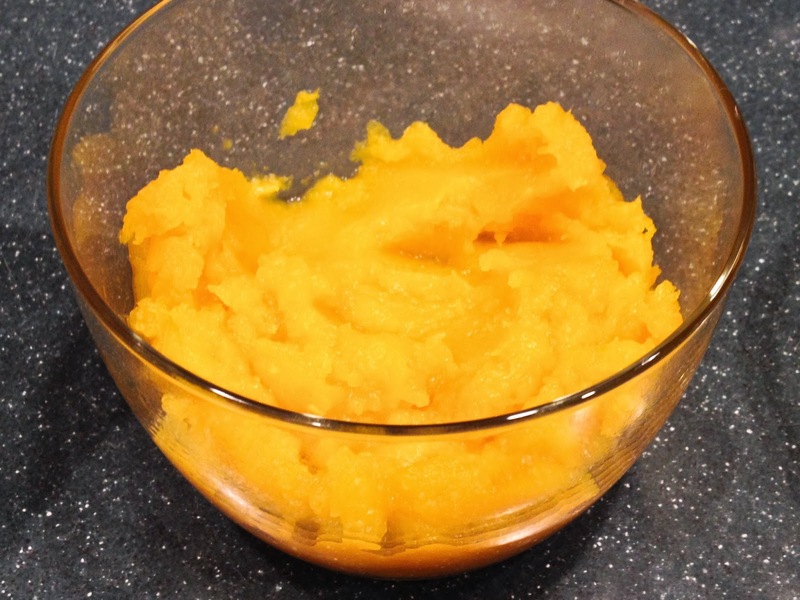 But over time, the purees got thicker and thicker. 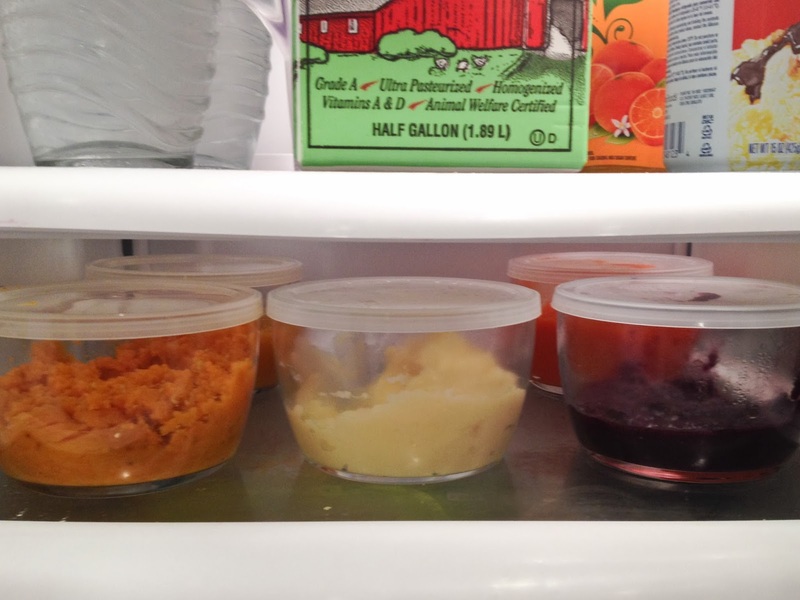 As little man began eating more and more, my system for making and storing food changed. 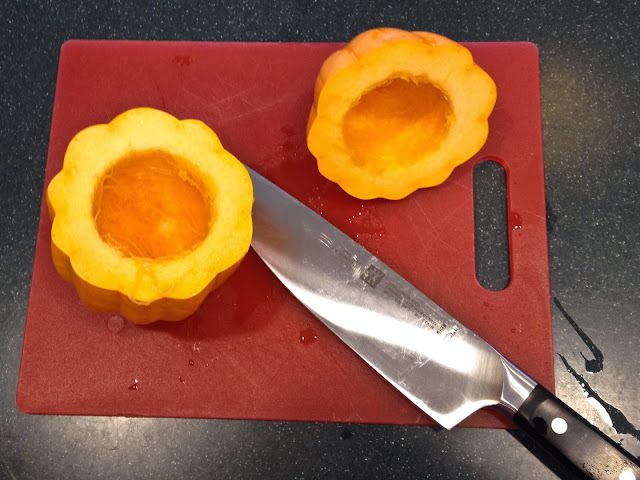 I would still use the Beaba Babycook or Baby Bullet for small batches, but to make larger quantities, I would cook up the fruit or veggie on the stove and then use our food processor to puree. Wrap it in foil and bake at 425 degrees for an hour. 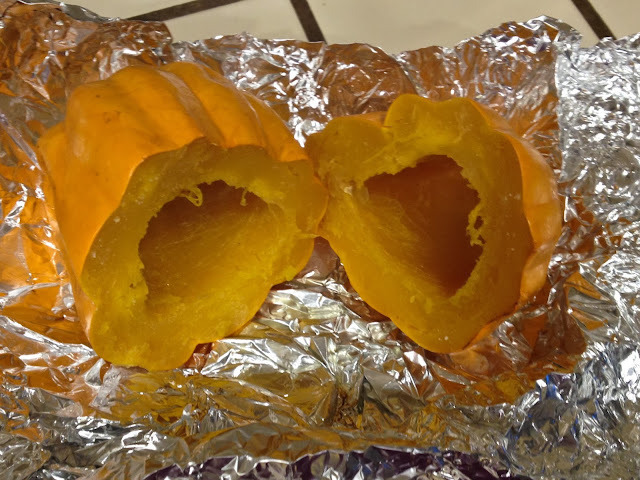 The squash would be nice and soft when I took it out of the oven. All I had to do was scoop it into a container - the consistency was perfect! 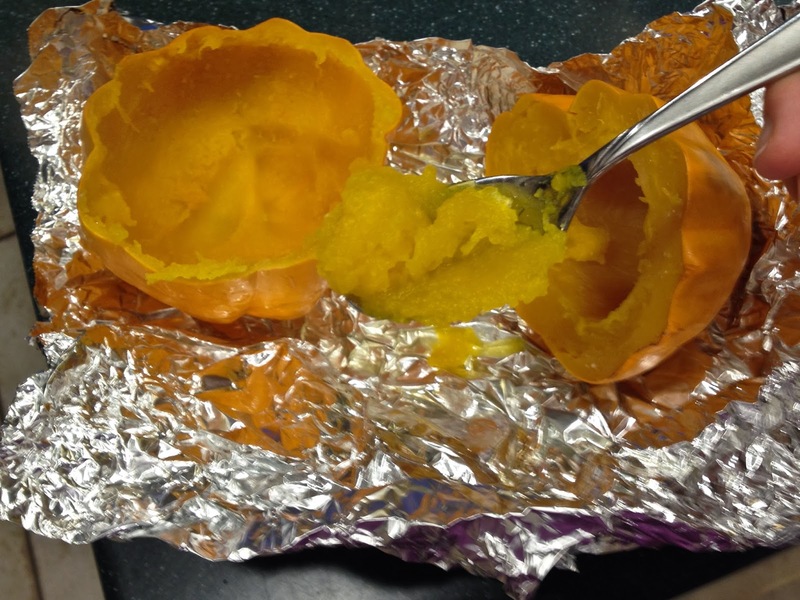 Sweet potatoes could also be done this way (below a golden acorn squash, sweet potato, acorn squash and pumpkin!). 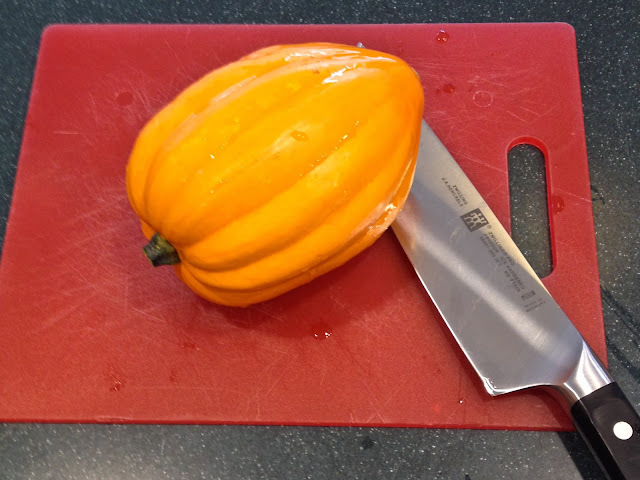 I think I sampled almost all the squash I could find! Parker really liked Butternut, and Delicata was the easiest to work with because of the thin skin. 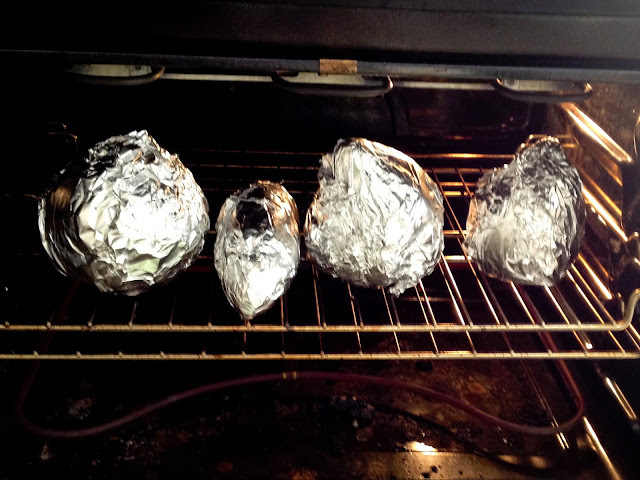 I would prepare them all the same way at the same time - easy peasy! 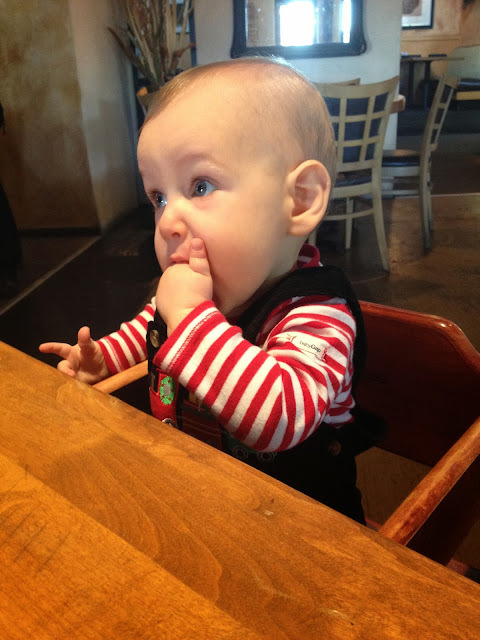 At seven months, we introduced finger foods. We started with Organic Puffs . 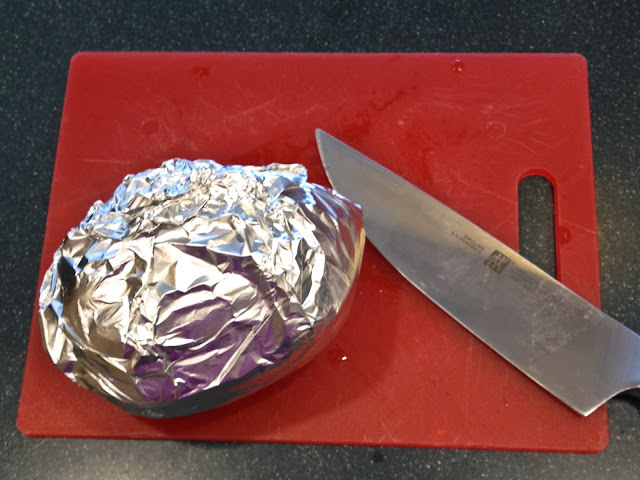 Little man knew exactly what to do with them, though it was his first time picking up something so small. His success rate was maybe one in five, but he was trying his hardest to get them in his mouth! His dexterity improved over the next few days and weeks from the practice, and he perfected his "pincer grasp" in no time! 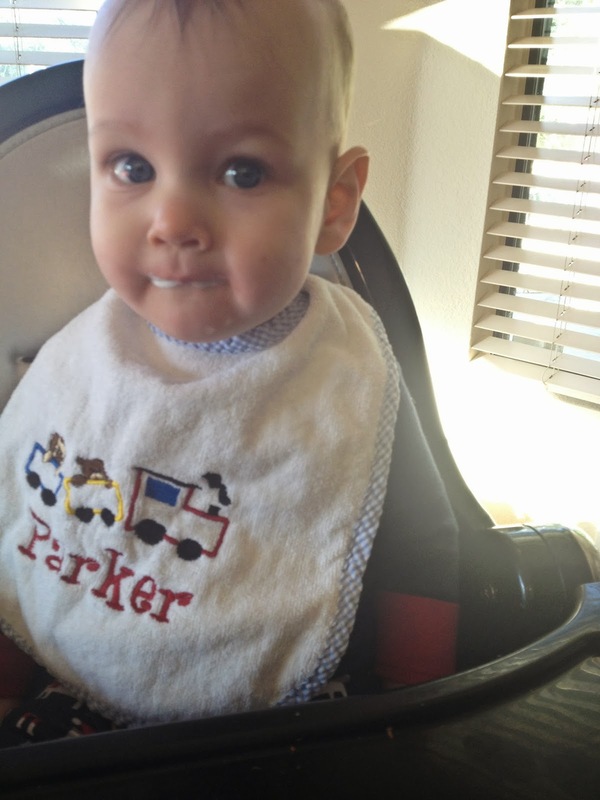 Seven months was also when Parker began "chewing" (is it called "gumming" if you have no teeth??). 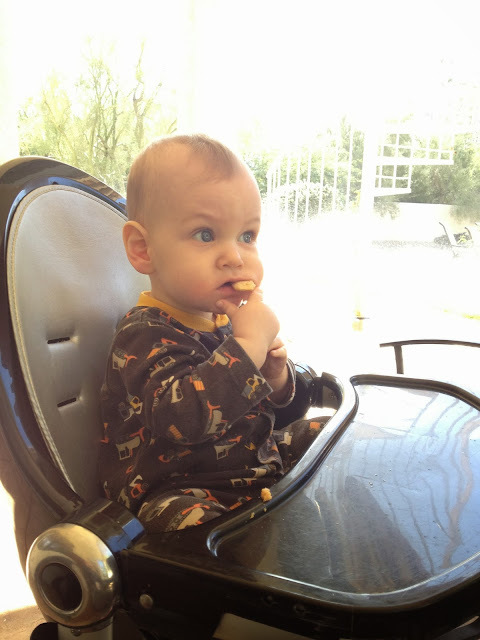 We followed the puffs with Teething Wafers (which were followed by Parker's first two teeth!). Around seven and a half months, we started seating Parker in restaurant high chairs when we went out to eat. Little man loved it. He'd be content for most of the meal just observing his surroundings, then we'd pull out a snack of puffs or a teething biscuit for a snack. At eight months, I began putting herbs and spices in P's purees and smashes. 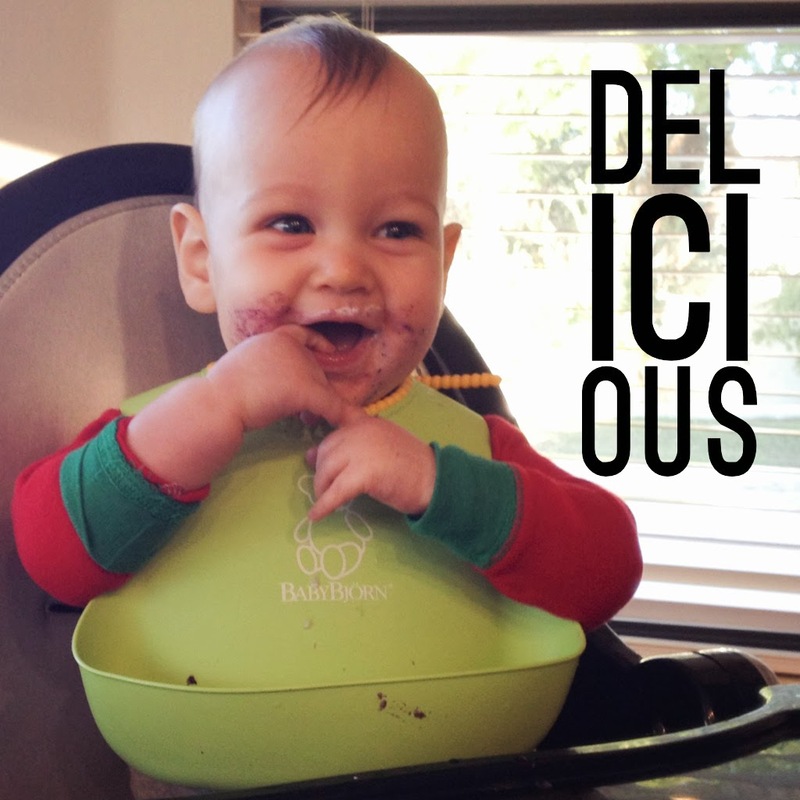 Think apples + cinnamon, avocado + cumin, pear + ginger, potato + dill... little man was especially fond of cinnamon! 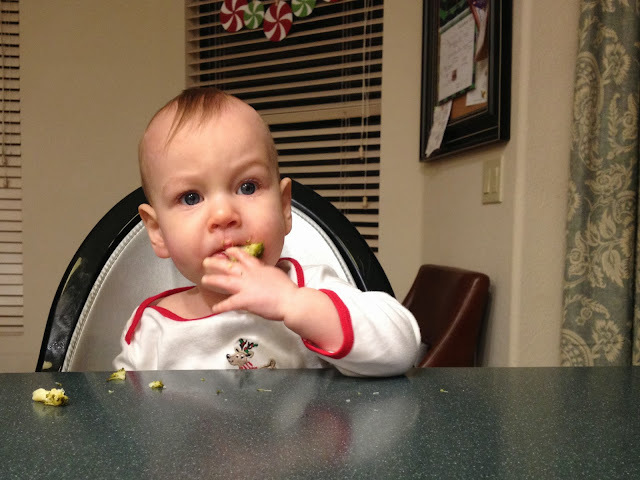 By this time, Parker was sampling various finger foods including banana, avocado, potato and (below) broccoli! 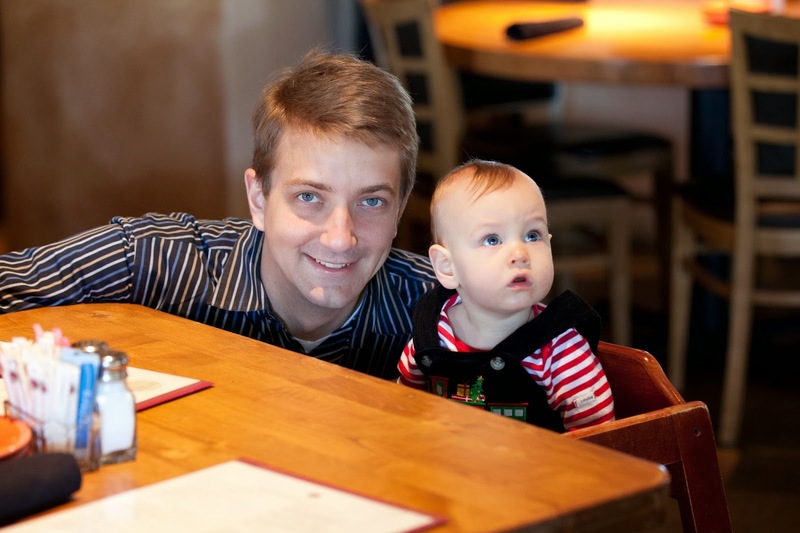 This is around when Parker really started "dining out" : ) If we are out and about, we now feed him organic baby food packets (with these oh-so-handy screw on spoons ) since it travels well (we just throw it in the diaper bag and it's good to go whenever). This is Parker's first meal with a buddy! And here getting ready to dine at Cantina Laredo with mamma and daddy! Around eight and a half months, I gave Parker his first dairy: plain, organic, whole milk yogurt! He couldn't get enough! 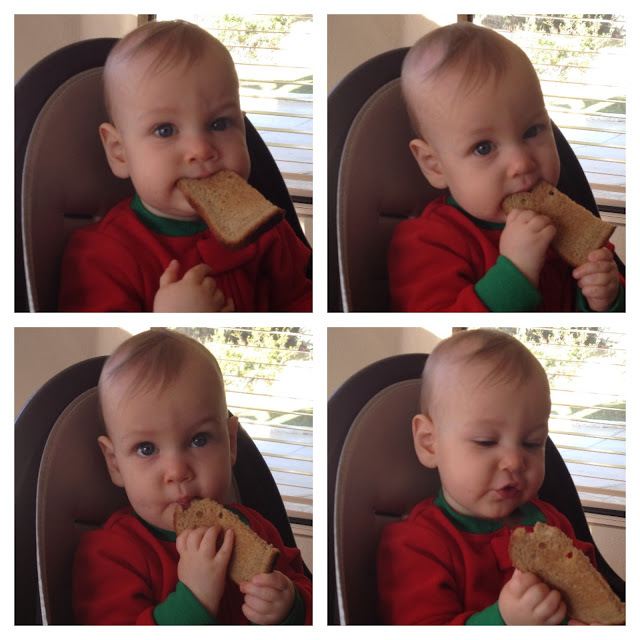 Just before Parker turned nine months, we gave him whole wheat toast. Right around then is when his two top teeth made their appearance (bringing his grand total to four), which made biting into toast that much easier! At Parker's nine-month doctor's appointment, we got the green light to basically feed little man whatever we're eating. 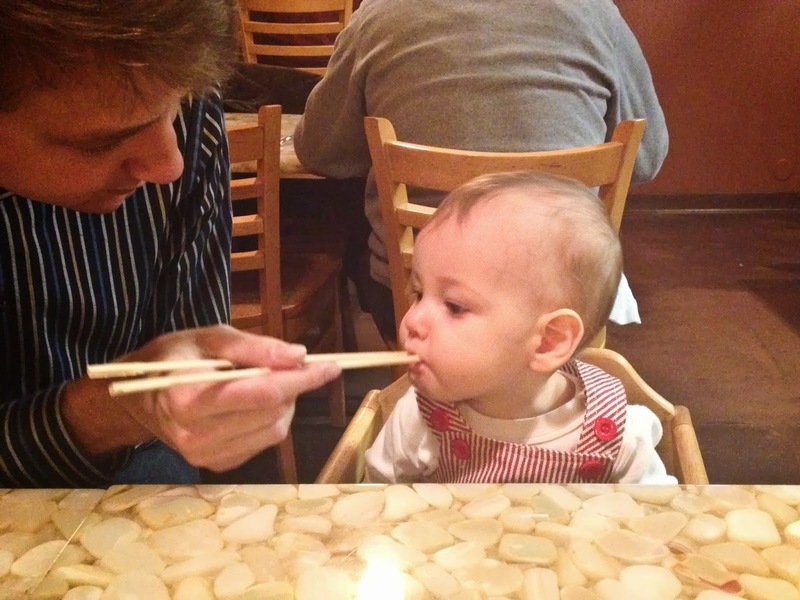 Max took this literally and that night when we went out for Vietnamese food he shared his beef noodle bowl with Parker (chopsticks and all!). 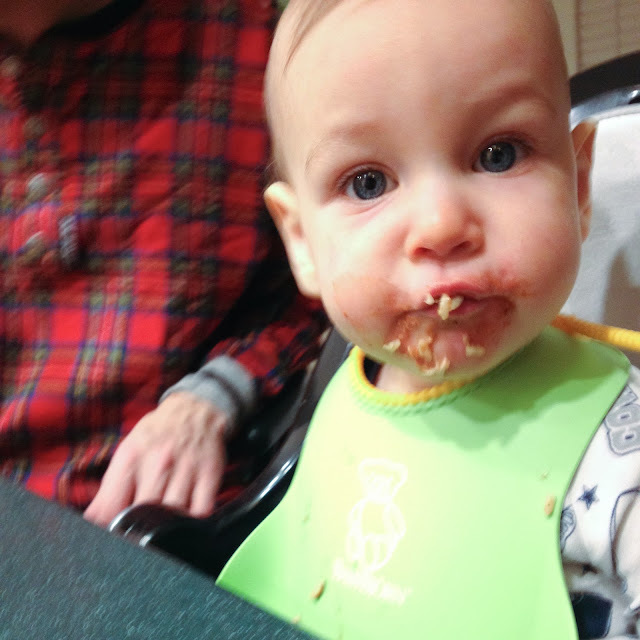 Since then, Parker has been sampling from our plates (pieces of Baked Ziti, carrots from our stew, chicken from a lettuce wrap). 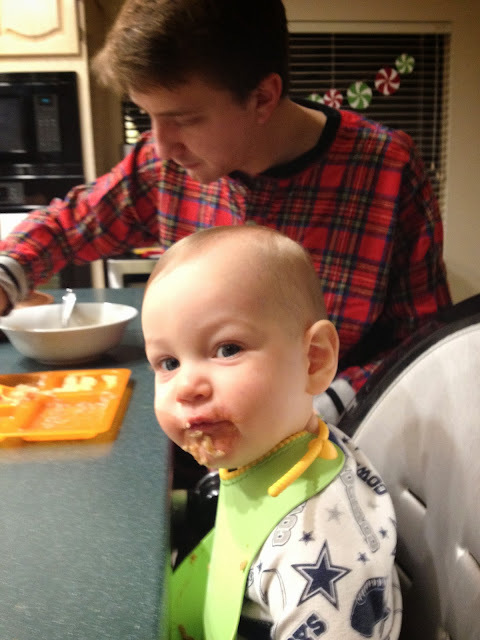 Just this past week, Parker actually had his first whole meal of mamma and daddy food. I was making slow-cooker Chicken Tikka Masala and just decided we'd give it a go with Parker. I added the brown rice that Max and I were also eating and threw in some pieces of cooked apple for finger-food practice. I wasn't sure how it was going to go over but little man loooved it. So as of now (nine and a half months) I'm doing a hybrid of baby food. I'm still making purees, but they are to accompany table foods and finger foods. I'm loving that Parker has been gobbling up such varied tastes and textures (Indian food! Onions! Vietnamese cuisine!) though I have been told that once babies hit the toddler stage they become quite picky. 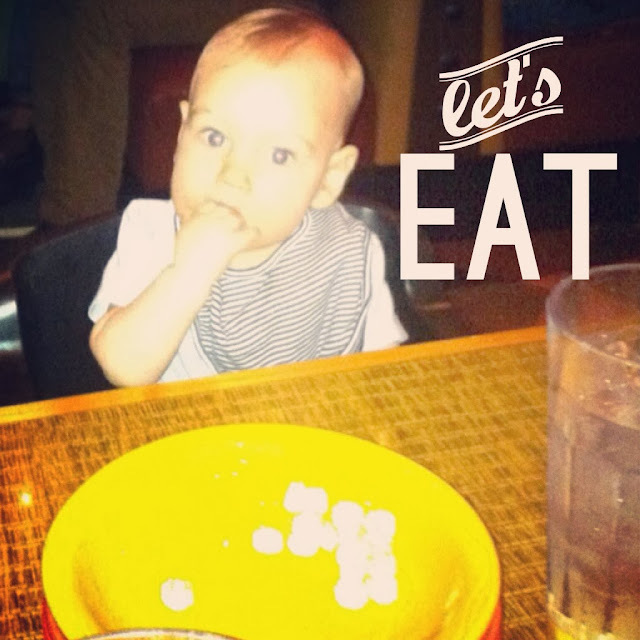 Here's hoping my precious little eater keeps his awesome appetite and mamma's love of food! Love this post! Thanks for sharing. 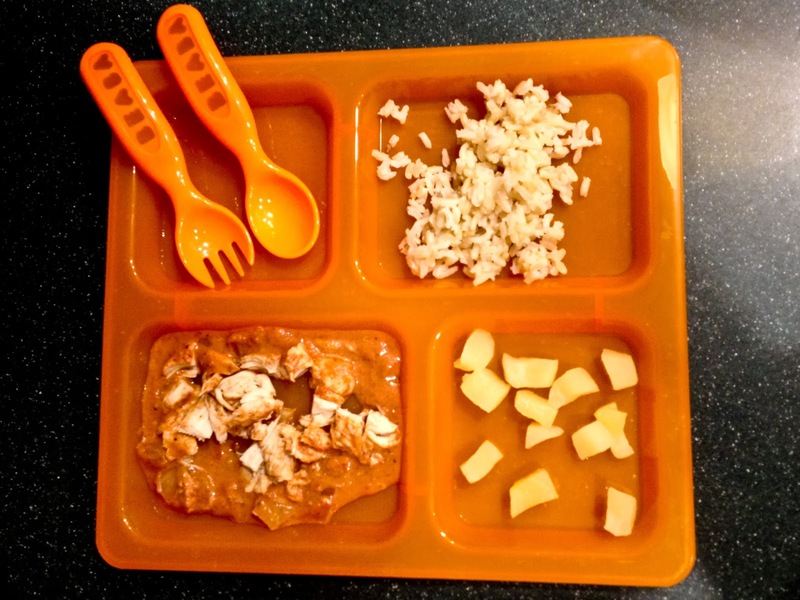 Would you mind sharing your recipe for slow cooker tikki masala?